In the event that the AU withdraws from the ICC, what would be the alternative for average Africans who seek justice for their sufferings? 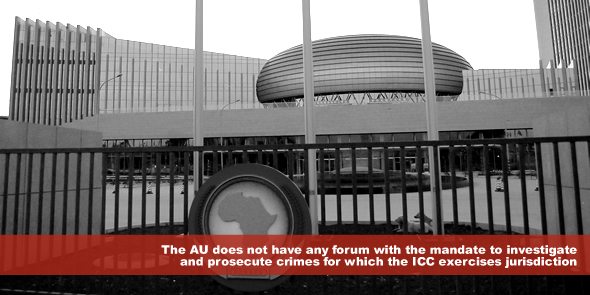 The AU does not have any forum with the mandate to investigate and prosecute crimes for which the ICC exercises jurisdiction. The AU is still conducting “studies and workshops” over how to incorporate genocide and other crimes against humanity into the mandate and jurisdiction of the African Court on Human and Peoples’ Rights. Further, the AU does not claim that the crimes were not committed, only that the accused are “so important” that justice should be deferred – at the expense of countless victims. This Statute shall apply equally to all persons without any distinction based on official capacity. In particular, official capacity as a Head of State or Government, a member of a Government or parliament … shall in no case exempt a person from criminal responsibility under this Statute, nor shall it, in and of itself, constitute a ground for reduction of sentence. Kenya did attempt to investigate, but the Waki Commission which, was established to probe the violence, failed and its efforts were passed on to the ICC. Had Kenya thoroughly investigated and prosecuted those responsible, domestically, there would be no ICC indictments. Kenya’s failure to live up to its obligation, accordingly, triggered the ICC’s prosecution. Since Nuremberg, international crimes have not gone unanswered by the international community. There have been similar prosecutions in Bosnia, Rwanda, Sierra Leone and Yugoslavia. In this new world order, leaders are increasingly being held to account for crimes that rattle the conscience of the world, and the senseless violence which occurred in Kenya was one such for which there must be accountability without compromise. The AU argues that other powerful nations such as Russia and the United States have not signed the Rome Statute, yet these very nations are only too happy to refer Africans to the ICC via the United Nations Security Council (UNSC). Apart from two referrals by the UNSC (Libya and Sudan’s Darfur), the majority of cases under the consideration of the ICC have been referred by state parties, of which 34 are African states. When international conventions are drafted, state parties are obliged to review such conventions. In the case of the Rome Statute, Articles 27, 28 and 29 were integral and unambiguous on accountability. If one analyses the current AU position, the only reasonable conclusion is that its member states either (1) did not review the Statute or (2) did review the Statute, but fail to appreciate the gravity of the provisions. Neither scenario is unacceptable as an excuse under international law. When the AU meets later this month in Addis Ababa to consider their anticipated ICC withdrawal, the AU might want to consider victims of atrocities in Africa and the need for accountability. Asking for a few “big men” in Africa to face their accusers in an international court of law is not asking for too much. Or is it? Wonderr Freeman holds a Bachelor of Science (Accounting) from the University of Liberia, an MBA (Finance) from the Cuttington University and a Bachelor of Laws (LLB) from the Louis Arthur Grimes School of Law, University of Liberia (Liberia). He is currently pursuing an LLM in International Trade and Investment Law in Africa at the Centre for Human Rights, University of Pretoria (South Africa). He previously served, for 6 years, the Liberian Government, lately as Section Head for the Liberian Anti-Corruption Commission Unit investigating the assets disclosures of public officials. Prior to this assignment he served as Liberia’s Governance Commission. His main research interest is international economic law, with a specific focus on Africa. Exiting the Rome Statute will not be the panacea to the prejudices against Africa. Africa needs to emerge strongly both in political stability and economic virility. The western powers are preying on the weaknesses of the continent. They’ll not do this to ASEAN nations or fellow western powers. What’s Africa’s bargaining chip? Is it their leaders or the polity? Let the bright minds in Africa be given a chance and incentive to work assiduously for Africa’s respect and blueprint for growth and evolutionary explosion.